It is possible to say too little and end up implying too much. Such is the case with this Marin County Environmental Health Department sign at the Green Bridge over Papermill Creek. In all likelihood, most visitors to Point Reyes Station (as well as many townspeople) would read this sign to mean Papermill Creek is polluted. Moreover, the sign seems to suggest a person can be harmed by merely dipping his toe in the water. Equally worrisome, Point Reyes Station’s water system is supplied by creekside wells not far upstream from the sign. The water system is, of course, operated by North Marin Water District, so I called NMWD senior chemist Stacie Goodpaster and asked if the town has a problem. Stacie was surprised to learn of the sign. North Marin’s wells are set back from Papermill Creek and fed by creek water that is drawn through the sand-and-gravel subsoil. Monthly tests at the wells and the water system’s treatment plant haven’t found bacteria in the drinking water, Stacie said. North Marin’s tests of Papermill Creek’s water have found only normal amounts of bacteria, including e-coli bacteria, she added. After a rain, of course, the amount of bacteria in the creek goes up temporarily, Stacie noted, because bacteria get washed into the creek. However, she added, North Marin’s current testing cannot determine the source of the bacteria; they come from soil, decaying plants, or animal waste. She felt reasonably sure there has not been any sewage leak into the creek, for that would cause there to be at least 50 times as much e-coli in the water. My next call was to David Smail, supervising health inspector for the Marin County Environmental Health Department. David’s first response was that the warning sign is overdue to come down. The county monitors the creek weekly from April through October, and the warning was supposed to come down soon after the Oct. 31 testing. David said he’d have the sign taken down right away. The rest of the situation, however, is more complicated. For example, the State of California sets different standards for freshwater and saltwater recreation. The standards also differentiate between swimming, surfing, and other aquatic activities in which a person might swallow water (Recreation 1) and aquatic activities such as boating in which a person is unlikely to drink the water (Recreation 2). David told me the warning signs go up when Recreation 1 standards are exceeded — even if the water may be safe for boating and other Recreation 2 uses. 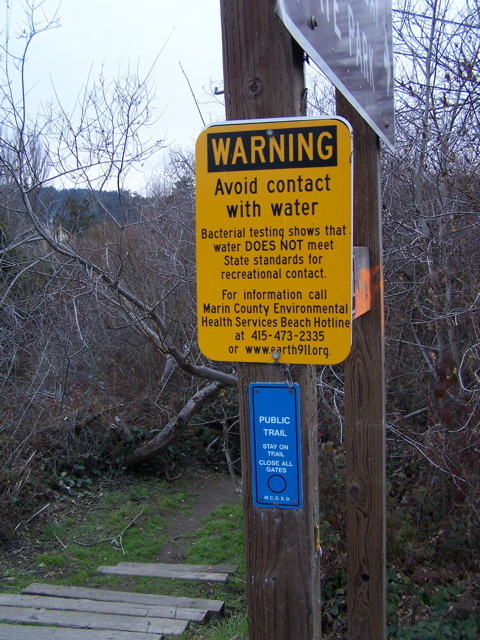 Unlike North Marin, which monitors water quality by testing for total bacteria and for e-coli bacteria, Marin Environmental Health tests for enterococcus bacteria. However, neither agency’s tests indicate whether there are any pathogens in the water. In fact, with the occasional exception of one strain of e-coli, most bacteria found in West Marin water are not themselves dangerous. Current water-quality tests determine only whether there are bacteria in the creek that MAY have passed through the gut of an animal or human. If either were sick, its waste MIGHT contain pathogens. Adding to the uncertainty, as Stacie at North Marin noted, such bacteria can also come from soil and decaying plants. David at Environmental Health told me that under state standards for Recreation 1 freshwater, the maximum number of enterococcus bacteria per milliliter is 61 in a single day’s sample (104 for saltwater). The last sampling at the Green Bridge resulted in an enterococcus count of 63 (only two over the limit), but under established “protocol,” that requires a sign, David said. In fact, according to people living along the creek, the sign has been up for months. Like Stacie at North Marin, David at Environmental Health and Environmental Health chief Phil Smith both stressed to me that the amount of bacteria in the creek goes up when it rains. As it happened, rainfall throughout California averaged 125 percent of normal in October, and Marin led the way with almost 4 inches falling at Blackpoint in Novato. After all that rain, however, the enterococcus count in Papermill Creek was only two points over the Recreation 1 limit, suggesting its normal water quality is quite healthy. Is all this an academic discussion? Not really. 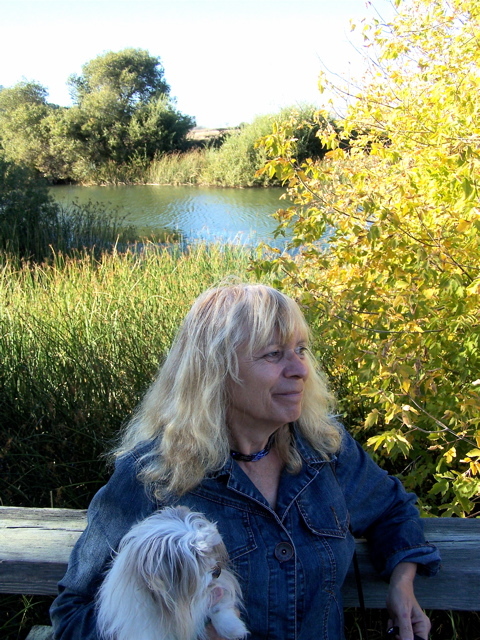 Linda Petersen of Point Reyes Station with her dog Sebastian at White House Pool on Papermill/Lagunitas Creek. As you could read in a posting from last October, Rod Ruiz, supervising ranger of Marin Parks, has been doing a good job of administering White House Pool. That great, little park was laid out to provide a number of overlooks along Papermill Creek for enjoying West Marin scenery, but a walker’s enjoyment of the view is inevitably diminished when she reads the creek is so polluted she should stay well away from it. Because current tests may primarily count naturally occurring bacteria originating with plants and animals in Samuel P. Taylor State Park, the GGNRA etc., a sign that fails to acknowledge this possibility unfairly denigrates West Marin, making its scenic countryside sound troubled in ways it may not be. 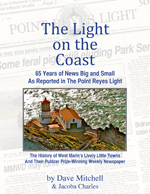 Phil, the Environmental Health chief, in fact acknowledged that in recent years, Tomales Bay and creeks flowing into it have (along with “Muir Beach North”) received bad publicity that “erroneously” portrayed them as having poor water quality. His department is now planning an $840,000 Beach Water Quality Testing Project to be financed with state money. The project will allow Environmental Health to determine if specific bacteria (such as a toxic strain of e-coli called O157H) are present in West Marin waters. In its initial stage, however, the project still won’t identify the source of bacteria in the creek — plant, human, or animal — and if animal, what kind. In short, if something somewhere is contaminating the creek, the county still won’t know what or where. And if most of the bacteria in the creek are naturally occurring, the county won’t necessarily know that either. However, Dr. Corey Goodman of Marshall, a National Science Foundation fellow, has offered the county $200,000 to refine its analysis of Tomales Bay water, Phil noted. If this leads to a second phase of the Beach Water Quality Testing Project, he added, the county might finally be able to track the sources of bacteria in Papermill and nearby creeks. Until then, however, the tourists who read the county’s warning signs are likely to return from West Marin talking about how polluted our waterways are while residents here will sometimes wonder whether it’s safe to even paddle a canoe in Papermill Creek. Sparsely Sage and Timely is powered by	WordPress 4.9.10 and delivered to you in 0.256 seconds using 50 queries.